Since its inception, the Internet has evolved from a purely technical artefact, in which all creators shared a common goal of interconnecting computers globally, toward a social phenomenon through a combination of uses and that evolution continues. The social and economic aspects that affect the Internet are as complex and interwoven the society and the economy itself. This complexity is based on the interdependence of disciplines that study changes in human nature, where economics, political science, humanities, psychology and law are linked to concepts like privacy, freedom of expression, intellectual property and social networks but also to topics like education, security, regulation, private life, communication, business, trust, intangible incentives, to name but a few. The “real world” users of the internet (i.e. consumers, citizens, students, politicians, scholars, artists, parents, etc.) constitute a powerful but also dynamic organism that has to be approached from a broad and holistic perspective. In this channel, we present the viewpoints of those who are studying the Future Internet. The aim is to provide access to wider social and economic challenges and trends so that discourse and debate on Future Internet research moves from a purely technological viewpoint to one that is balanced by real socio-economic needs. For this year's edition, emphasis has been placed on consumer perceptions of broadband speed, on the quality of experience of access services, on consumer affordability, on factors for subscribing and switching between communication service providers and on the transparency of tariff information. More specifically, the main themes of the summary are: the different types of telephone access available to individuals and in the home, Internet access and its quality, penetration of communication service packages, consumer sensitivity to the speed of the Internet connection,the quality of experience of communication services, affordability of telephone and Internet services, the transparency of communication service pricing, factors in switching Internet service providers and service package providers and television access and means of reception. When broadband and narrowband access are combined, approximately seven out of ten EU households have home Internet access (68%). This proportion has increased by four percentage points since the 2012 report. The main reasons are lack of interest (65%), cost (19%), and that either the respondent or their household members did not know what the Internet was (7%). The survey found that nearly six out of ten respondents (57%) did not know the maximum download speed of their Internet connection. Furthermore, nearly a quarter of the respondents who knew their download speed said that their actual Internet download and upload speeds did not match the terms of their contract. 11% respondents would be willing to move for either both options. Slightly less than three out of ten respondents had been blocked from accessing online content or applications either often or sometimes while using the Internet from home (29%). Furthermore, approximately four in ten respondents (43%) either sometimes or often experienced difficulties accessing online content and applications from home due to insufficient Internet speed or downloading capacity. On the other hand, the proportion of respondents who reported that access to online content or applications is sometimes blocked on their mobile phones has slightly increased to 20% from 16% in the previous report. Furthermore, around four in ten respondents thought their mobile Internet connection provider was responsible for blocking content (37%) and more than three in ten thought the application or content provider was responsible (32%). Approaching one in five respondents believed they were blocked from accessing content due to geographical copyright restrictions (17%) or by the manufacturer of their mobile phone (15%). Over half of EU citizens limit their national and international mobile phone calls because of concerns about cost (respectively 55% and 54%). Around one-third of EU citizens (34%) use the Internet to make cheap phone calls (using voice over IP technologies), which is a seven percentage points increase since the 2012 report. Slightly less than one third of EU citizens disagree that it is easy to compare the terms of service packages (29%), a 3-point increase since the 2012 Eurobarometer report. More than four in ten respondents reported that they have considered changing their bundle provider (42%), a nine percentage point increase since the previous survey (33%). Global mobile communications market is still a fast growing industry with 11% growth. Perhaps the most interesting statistics are that there are 4.3 billion unique mobile users while 1.3 billion 3G connections are active. The Future Internet (FI) promises much if only in respect of the opportunity which might be available to exploit all the benefits of the Internet as it is now, but bigger, better, more secure and more efficient. As the technology develops, more and more potential is created. Bring users into the picture – as has been seen to be essential on many occasions in SESERV, not least the workshops in Oxford, Athens and Brussels, as well as the focus groups described in D2.2 and D3.2 – then there are benefits to them in various areas, such as access to and the generation of content; the potential to engage in ad hoc as well as existing on-line communities; but also to be able to learn about and effect the environment; all of which will ultimately have an effect on the network and infrastructures underlying all these activities. In each of these areas – content, community, the environment, and networks – as we move forward there will doubtless be risks and challenges that must be addressed (the red boxes in the figure), though at the same time there will be greater opportunities especially for inclusion and on-line presence (the green boxes). The challenges and opportunities are discussed more fully in D2.2. Here, let’s just summarise SESERV’s recommendations for a way forward. Citizenship, Awareness and Education: a theme in both the Digital Agenda for Europe and Horizon2020: how do we make the FI serve all? Participant/User Experience: which has come up time and again (cf for instance the Internet of Services presentation we gave. Need to revisit what content is now being generated and shared. It doesn’t all have commercial value. Source: SESERV User-Centricity Survey (29 of 55 total respondents reported using tools to engage with users). Chart created by Anne-Marie Oostveen. The SESERV project surveyed future internet projects, and asked them to identify the methods they used to understand their users and uses of the technology they are developing. 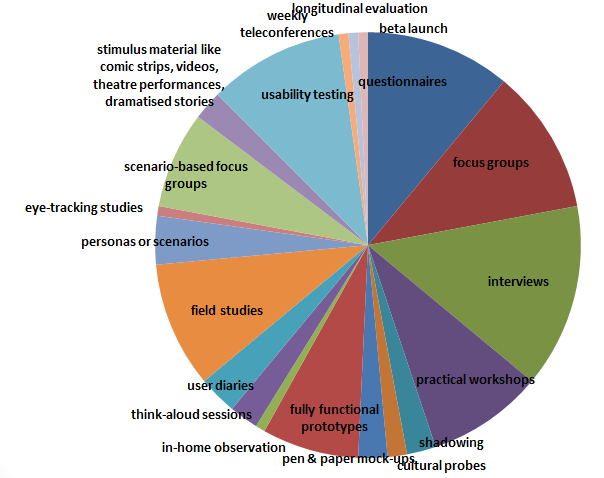 As you can see in the above chart, while traditional methods such as questionnaires, focus groups, and interviews were mentioned by about 1/3 of respondents, a wide variety of other tools and techniques were also reported, ranging from user diaries, to eye-tracking studies, to stimuli including comic strips and theatre. The wide variety of techniques suggests that user-centric approaches to design are an important part of the FI ecosystem, but that no single technique dominates for doing so. It also suggests that there would be potential interest in workshops on methods for engaging users using some of the most innovative techniques. For this year's edition, an emphasis has been made on tariff transparency, quality of services and consumer switching, in relation with the current policy debate on net neutrality. Slightly more than half of EU citizens (58%) do not know what their maximum download speed is (58%). Slightly less than half of respondents (46%) sometimes experience difficulties accessing online content and applications due to insufficient speed or capacity, but only 8% reported experiencing these inconveniences often. Only 14% of EU citizens would be willing to pay more for a faster Internet connection. Among those who would pay more, 39% want to be able to upload or share content. Respondents who are willing to pay more for an Internet connection with a higher speed or downloading data capacity are more likely to have encountered difficulties accessing online content. Indeed, among those respondents who were unwilling to pay more for a faster Internet connection, over half (57%) report never experiencing difficulty accessing content due to limited speed. By contrast, more than six out of ten respondents who would be willing to pay more experienced difficulties accessing content (62%). The more the respondents are willing to pay the more frequently they experienced problems. Nearly three respondents out of ten (29%) willing to pay 33% or more experienced frequently difficulties whereas they are 15% of those who are willing to pay up to 15% more. On average, more than eight out of ten EU citizens would not be prepared to pay more for an Internet connection with a higher speed or a greater downloading capacity (82%). Most of these citizens would only be willing to pay up to 15% more (11%). A quarter of EU citizens have experienced blocking of online content when surfing the Internet from home (26%). Those respondents who are not prepared to pay more have most likely less experience with blocking of online content, compared with those who would pay more for a faster connection (26% and 35%, respectively). However, there is a different pattern among respondents who are ready to pay more. Those respondents who are ready to pay up to 15% more, or between 16 and 33% more, are more likely to have experienced blocking of online content than those who are willing to pay more than 33% more for higher speed (35% and 34% vs. 26%). Most experiences of blocking appear to relate to Internet users trying to access multimedia resources. The most common activity interrupted by blocking was watching videos (33%), followed by listening to music (21%), downloading free video content (19%) and watching live events (17%). Filtering whilst playing online games (17%), downloading free audio content (15%) and watching television (13%) were also mentioned by a substantial proportion of respondents. Only one in twenty (6%) respondents reported having experienced blocking whilst trying to make Internet phone calls, although this may reflect the relatively low incidence of Internet phone calls. One in five users of mobile Internet has experienced blocking of content (20%), a figure five percentage points lower than the levels of blocking experienced when surfing from home. Half of EU citizens are not aware that network operators and service providers may monitor the content they access (49%). EU citizens generally oppose monitoring by service providers. 85% of respondents agreed that service providers should inform before monitoring for any reason. They also largely oppose to monitoring of traffic for marketing reasons. 87% of respondents agreed that service providers should request authorisation before monitoring for marketing purposes. A large majority of EU citizens (86%) would want to be told if any of their personal data was lost, stolen or altered in any way. 72% would want to be told under any circumstances, but 14% of citizens would only want to know if they were at risk of financial harm. Awareness of content monitoring by network operators and service providers is fairly limited. Fewer than half of EU citizens (43%) are aware of this practice. Citizens in all Member States widely agreed that service providers should inform customers before monitoring their traffic data and communications. Price is the most important factor when subscribing to the Internet. Nearly half noted cost as their first consideration (45%) followed by maximum download speed (13%), the fact that the Internet subscription is part of a bundle (12%) and the customer service offered (7%). No other factor was cited by more than 5% of respondents as their first consideration. Among those respondents who correctly stated the maximum download speed in their contract, two-thirds (67%) agreed that the speed matched the terms of their contracts. Four out of ten EU citizens experience difficulties accessing online content and applications due to insufficient speed or capacity (42%). However, only 8% claim that such difficulties are experienced often. Slightly fewer than half of households buy bundled communications services (43%). The most commonly cited aspect of bundled services is the convenience of a single invoice (43%), followed by the perception that they are cheaper than paying for each service separately (31%). Telephone access is nearly universal (98%) among EU households. There has been no shift in the types of telephone access across the EU since spring 2011 or winter 2009. Most households have both fixed and mobile access (62%) and this EU average has remained stable. Making phone calls via the Internet has remained broadly stable since spring 2011 (27%, down from 28%). Internet telephony is most popular in NMS12, where 32% of households use it on average. Most mobile phone users limit their calls with their mobile phones because they are worried about communication charges (63%). Data protection and the legal frameworks to support it are an urgent concern of the Future Internet’s user base. Legal expert Aleksandra Kuczerawy tells us the critical areas to look out for, and how to prepare for the legal advances now developing. The workshop will take place in Brussels on June 20, 2012, right before the Digital Agenda Assembly. Participation is open and free-of-charge. Take the opportunity and register on-line. Aleksandra is a legal researcher in the Interdisciplinary Research Center for Law and ICT (ICRI) at the Katholieke Universiteit Leuven. She joined ICRI in November 2007. She was a part of the study team conducting the independent study on indicators for media pluralism in the European member states, commissioned by the European Commission (DG INFSO). She also conducted research in the area of Spatial Data Infrustructures (SDI) while working on access and licensing protocols in the eContentplus OneGeology Europe project. Currently she conducts research in the field of privacy and identity management in new technologies. She works on the European Project PrimeLife (Privacy and Identity Management in Europe for Life). Lately she has expanded her research field to legal aspects of User Generated Content (UGC) in the European Project SocIoS (Exploiting Social Networks for Building the Future Internet of Services) where she is working on privacy aspects as well as liability of Internet Intermediaries. Moreover, Aleksandra is an assistent editor of the International Ecyclopeadia of Law (IEL) - Cyber Law. IDC looks at the growing market segments of the Future Internet, and how the social and economic context of its “Information Society Index” applies to its industry stakeholders. The analysis and forecast will set a context for much of the discussion throughout the day. Stephen Minton is a Vice President and analyst at IDC covering global ICT markets. He manages IDC’s industry-standard Worldwide Black Book research, which tracks ICT spending in 54 countries. In this role, he co-ordinates IDC’s global IT spending research and analysis, helping IT organisations around the world with their planning, resource allocation and competitive analysis initiatives. Additionally, he is responsible for the IDC Information Society Index, which benchmarks countries according to IT and Internet socio-economic impact and penetration. Stephen is the author of papers which focus on globalisation and the spread of technology into emerging markets, and is a regular speaker at major international events and conferences on the subject of macro-level ICT trends. In 2002, he addressed the United Nations in New York, speaking to UN ambassadors on the subject of the Information Society. He is regularly quoted for his views on ICT market trends by major media publications, and has featured on CNBC and Bloomberg television. Stephen previously worked with Digital Equipment Corporation (DEC) in a marketing role. Originally from Hartlepool in the North of England, he graduated from the University of Salford in 1995. He has also worked in the field of consumer market research with Millward Brown International. He moved from IDC’s UK office to the United States in 2001, where he spent ten years in Massachusetts before returning to the UK in 2011. He currently lives with his wife and two daughters in Hartlepool, England. The Network of Excellence Internet Science is currently inviting applications from early career researchers for the first Summer School to be held in Oxford from 12-18 August 2012. The theme of the summer school is "Internet Privacy and Identity, Trust and Reputation Mechanisms," with sub-themes addressing online identity and ACTA/SOPA/CISPA. The principal aim of the programme is to promote interdisciplinary discussion of issues related to Internet Science among early career researchers (advanced PhD students and those in the first four years of their research career) engaged in research related to Internet privacy and identity, trust and reputation mechanisms. Daily activities will be structured around morning lectures and afternoon discussions aimed at developing participants’ thinking on a range of issues central to the Internet. Participants will have the opportunity to discuss their research with faculty and other early career researchers. A range of social events will provide informal opportunities for continued discussions and networking among participants. The summer school will draw upon the strengths of the Network of Excellence in Internet Science (described below) and will involve participation of many of its members, in addition to colleagues from partner institutions. Exchange institutional research projects, methods, and interdisciplinary perspectives. We welcome applications from early career researchers in any discipline whose work in the field of Internet research engages with the theme of the summer school and reflects the disciplinary base of the Network of Excellence in Internet Science, as described below. The Network of Excellence in Internet Science aims to develop an integrated and interdisciplinary scientific understanding of Internet networks and their co-evolution with society. The network is composed of over thirty research institutions across Europe from a variety of disciplines including physics, sociology, game theory, economics, political sciences, network engineering, computation, complexity, networking, security, mathematics, humanities, and law, as well as other relevant social and life sciences. Its main objective is to enable an open and productive dialogue between all disciplines that study Internet systems from any technological or humanistic perspective, and which in turn are being transformed by continuous advances in Internet functionality. Delegate fees are £900 and this includes 7 nights’ en suite accommodation at Queen’s College, daily breakfast, lunch (including one BBQ) and refreshments, and two evening college dinners. Summer school participants will have an opportunity to take part in Oxford social activities. Applications must be submitted by 5p.m. (GMT) on Friday, June 1st. We will notify successful applicants by Friday, June 15. Please contact Tim Davies for further information.